Paul Smith with his 4lb 4oz perch. A record-breaking fish has been taken from the River Nene. City rod Paul Smith caught a whopping 4lb 4oz perch last week from the Orton area and it’s thought to be the biggest ever perch caught on our local river. It’s certainly the biggest I’ve ever come across and that’s going back well over 30 years. Smith is a regular on the river between Stibbington and the city centre and on a recent trip caught the huge perch at Orton Locks on a legered lob worm close in from slack water. Also last week city rod Carl Street caught a fine 20lb plus pike from the Orton area. So the river is alive and very healthy right now and with specimen fish thriving it’s well worth a visit. The final round of the King Of The Fens League was fished at the weekend on the Middle Level. Out in front on the day was Paul Spriggs with 35lb 6oz. After a slow start on the pole, he switched to a groundbait feeder and caught well through to the end of the match. Runner-up was Andy Lawrence, who weighed in 17lb 7oz, followed by Joe Roberts and Chris Lynn, both with 17lb 4oz. On the team front the Sensas Mark One Black side took the league title and also had the pleasure of seeing John Taylor take the league individual crown with a 50-point total. On the day individual result: 1 Paul Spriggs, 35lb 6oz: 2 Andy Lawrence, 17lb 7oz: 3 Joe Roberts, 17lb 4oz; 4 Chris Lynn, 15lb 4oz; 5 Greg Brown, 10lb 11oz; 6 John Price, 8lb 13oz. Top five teams on the day: 1 Sensas Mark 1 Black, 40pts; 2 Sensas Mark 1 Newill, 35pts; 3 Stanjay Gold, 33pts (28lb 9oz total weight); 4 Browning Hotrods, 33pts (21lb 9oz total weight); 5 Sensas Mark 1 Baggers, 32pts. League after final round: 1 Sensas Mark 1 Black, 12pts; 2 Sensas Mark 1 Baggers, 15pts; 3 Browning Hotrods, 16pts; 4 Sensas Mark 1 White, 17pts; 5 Stanjay Gold, 21pts; 6 Sensas Mark 1 Newill, 25pts; 7 Sensas Mark 1 Drainrods, 26pts; 8 Sensas Mark 1 Allstars, 27pts; 9 Boston & District A.A, 29pts; 10 Sensas Mark 1 Misfits, 34pts. League overall individual: 1 John Taylor, 50pts (Sensas Mark 1); 2 Duncan Ray, 44pts (Stanjay Gold); 3 John Bates, 43pts (Sensas Mark 1). 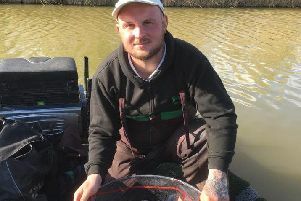 On the local match-fishing scene, Lee Kendal took yet another victory in the JVAC match fished on Four Islands and Horseshoe Pool on the Decoy complex. Kendal drew peg three on Four Islands and fished with casters shallow on a short pole line to put a fine 177lb net of small carp to the scales. Second was Chris Saunders from peg six with 103lb. On the Horseshoe Pool, new member Dave Corcoran topped the field with 141lb from peg 12, followed by Nick Carlton on peg three with 109lb. Some huge weights were recorded in the Decoy Saturday Open on the Oak Pool - none better than the 308lb 8oz net taken by Shaun Coaten. Ian Chestney had 286lb for second place followed by Danny Carlton in third place with 241lb 11oz.